WOULDN'T IT BE FUN to sit down with ten or twelve of the people who have made the most important contributions to cattleya hybridization over the last 60 years, and listen to them share their knowledge about landmark crosses, famous clones and important lines of breeding? If you're like me, this would be utterly fascinating - the only obstacle is that you don't have five years to devote to traveling and extensive interviews. Fortunately for us, one of the country's most knowledgeable hobbyists specializing in cattleyas has done this, and published a wonderful book to report his findings. This illuminating volume traces the development of all major lines of caffleya hybrids from their species origins to their state today. The author consolidates perspectives from promnent American hybridizers and commercial growers, articles from scientific and orchid trade magazines, and his own 30 year experience in growing orchids in a clear, lively and engaging style that makes this book a real page-turner. 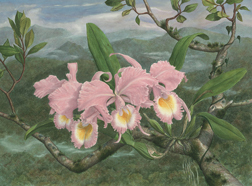 He includes first-rate chapters on culture, orchid genetics, hybridizing strategies, and the history of the orchid industry in the United States. The text is illustrated with 362 stunning color photographs; many of these are of historic clones and hybrids that I have never seen pictured before. Historically important figures such as Roy Field and Leo Holguin contributed a number of these images. I highly recommend this book and expect that it will become a classic reference for the hobbyist and commercial grower alike...."